‘Join Me’ is the true – if bizarre – story of a man who started a ‘movement’ by accident. Inspired by a recently deceased relative who had failed to build a pacifistic community, Danny Wallace placed an advert in a magazine that simply said: "Join me. Send one passport-sized photograph to ...". Wallace offered no further explanation and claims he hadn’t a clue what he would do next, but to his amazement people responded in ever-growing numbers. Eventually Wallace had to offer his burgeoning membership of ‘joinees’ a reason for their existence. He found it in the concept of RAoKs (Random Acts of Kindness) that were to be performed, preferably to strangers, every Friday. “The Lord had said to Abram, ‘Leave your native country, your relatives, and your father’s family, and go to the land that I will show you. I will make you into a great nation. I will bless you and make you famous, and you will be a blessing to others. I will bless those who bless you and curse those who treat you with contempt. All the families on earth will be blessed through you’” (Genesis 12:2-3). “I am sending you to the Gentiles to open their eyes, so they may turn from darkness to light and from the power of Satan to God. Then they will receive forgiveness for their sins and be given a place among God’s people, who are set apart by faith in me” (Acts 26:17-18). We make a mistake if we fail to appreciate that following Jesus is meant to be a life of adventure and service rather than a cycle of drudge and boredom. Ron Hutchcraft sums it up succinctly: “The Lord of the universe stands ready to pick up your life and give it a significance, a sense of fulfillment beyond anything you have ever experienced” (Called to Greatness, Moody Press). It’s certainly been like that for me. I have seen people healed and I have worshipped on a battlefield. I have seen people completely transformed and relationships restored. And, on reflection, I have to recognise that some of the most significant moments of my ministry have occurred when I have responded to the Lord’s invitation to engage in various forms of short-term mission, in countries as varied as Croatia and the southern United States. I will always treasure, for example, the memory of a Christian couple I met in the town of Nogales on the Mexican border. They had no regular income and yet they were feeding and clothing up to a hundred people daily. The Lord continually supplied their needs. In fact they even had a ‘Jesus account’ in a local store because the owner had discovered that Jesus always paid his bills! 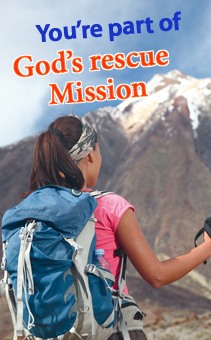 Engaging in mission is always an invitation to discover the reality and relevance of the living God. As Henry Blackaby and Claude King once wrote: “When you know what God is doing then you know what you need to do – you need to join him” (Experiencing God, Lifeway Press, Nashville). Have you? Lord, I am willing to do anything you want. I simply want to know what you would like me to do. Amen.